Mýrdalsjökull is the southernmost glacier in Iceland and is almost 600 km2. It covers the upper part of a large volcano. The mountain is about 30 km in diameter and the highest peaks reach 1500 m a.s.l. In the center of the ice cap is the Mýrdalsjökull caldera. It is oval in shape with the longest axis NW-SE and covers an area 110 km2. 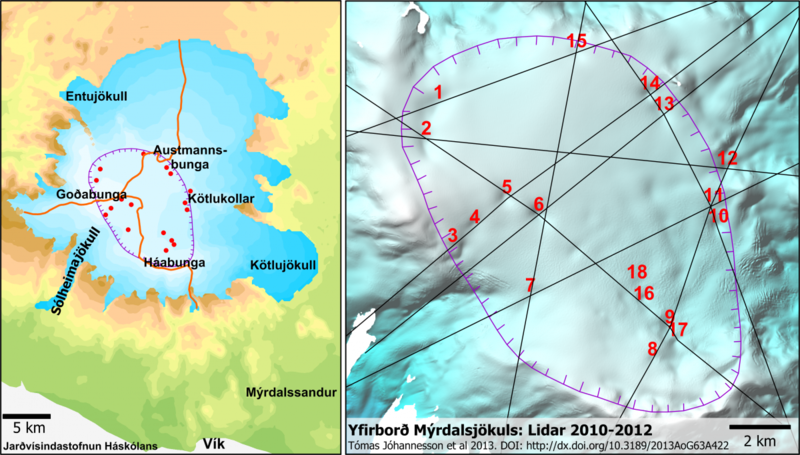 The highest points of the ice cap lie on the caldera rim and include Goðabunga, Háabunga, Austmannsbunga, Enta, Entukollar (see maps and pictures 1 and 2). Within the caldera the ice is hundreds of meters thick. 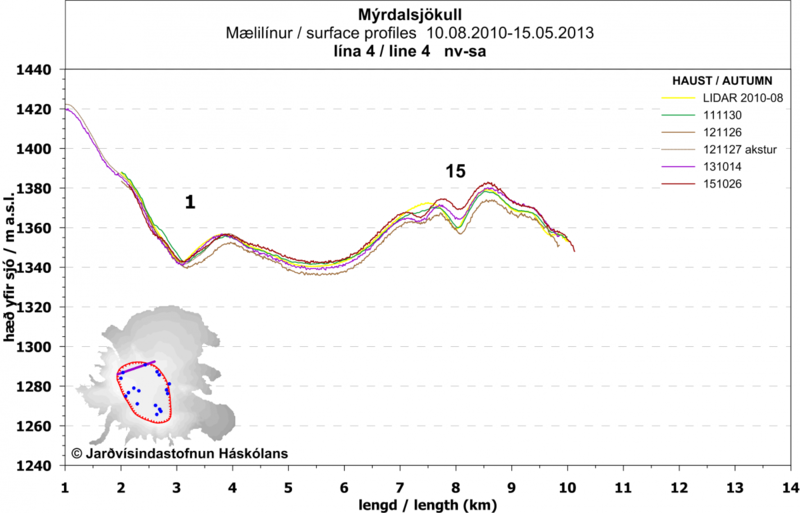 During the summer of 1999 some activity was noted within the Mýrdalsjökull caldera. 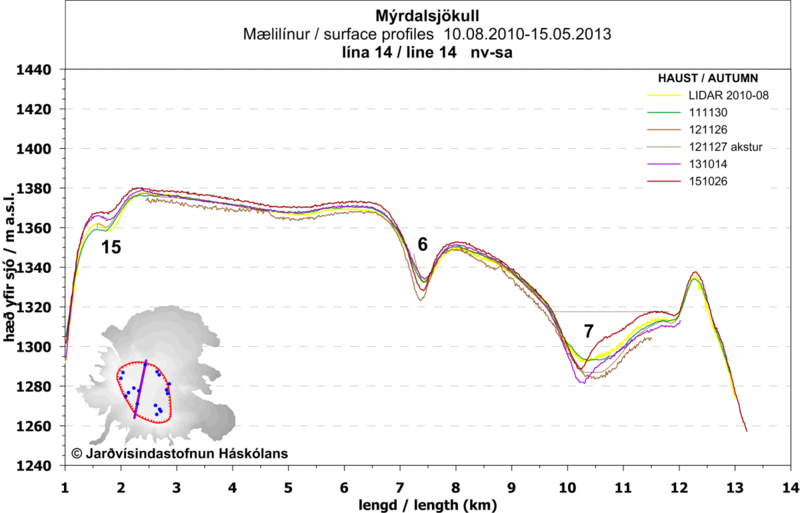 On the night of the 18th July came a sudden flood in the river Jökulsá á Sólheimasandi. 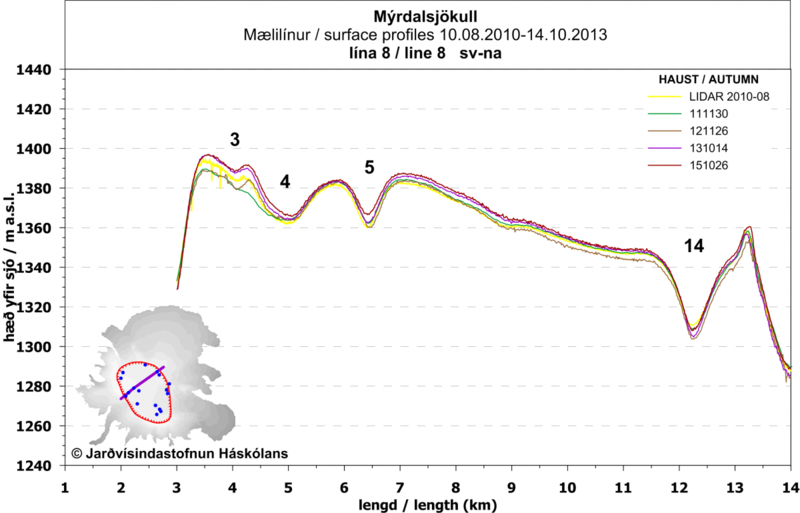 The source of the flood was meltwater from a depression formed simultaneously in the glacier surface, within the ice drainage basin of Sólheimajökull (picture 3, depression 7). After the flood existing depressions enlarged and crevasses were formed. 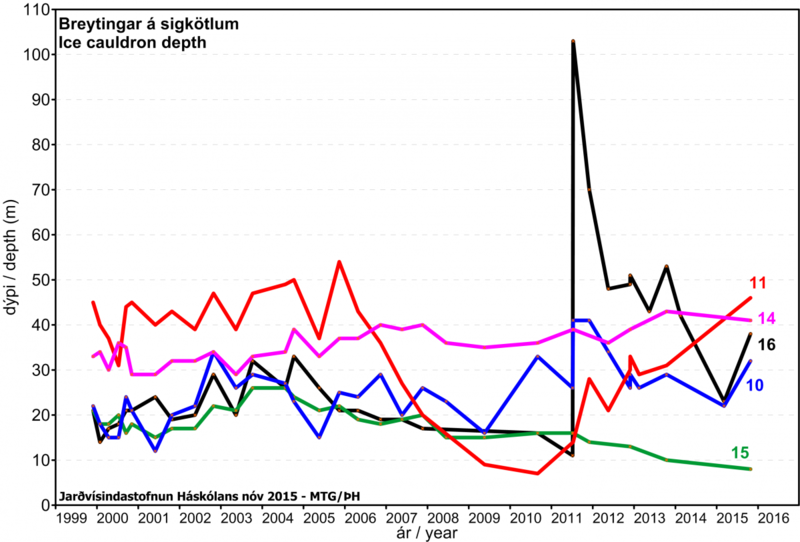 The depressions became deeper during the summer and increased in number. The reason was increased geothermal activity. 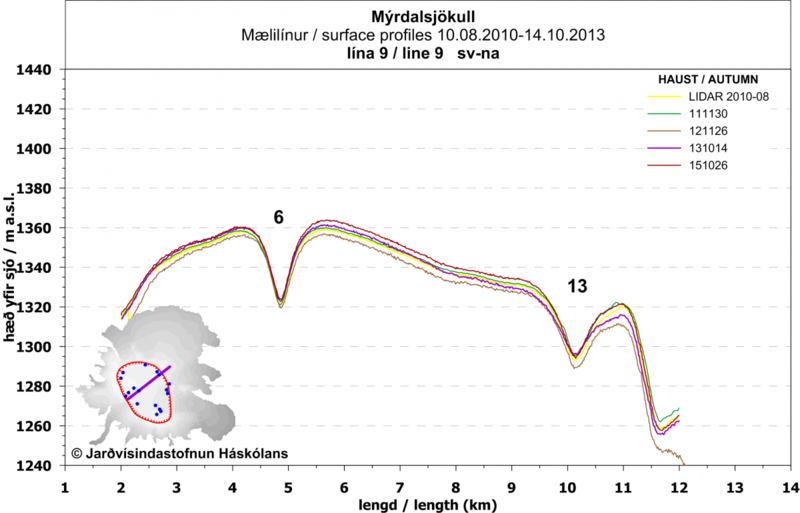 It is possible that there was a small eruption at the head of Sólheimajökull that formed depression 7 and caused the flood. In July 2011 another event occurred similar to the one in 1999. 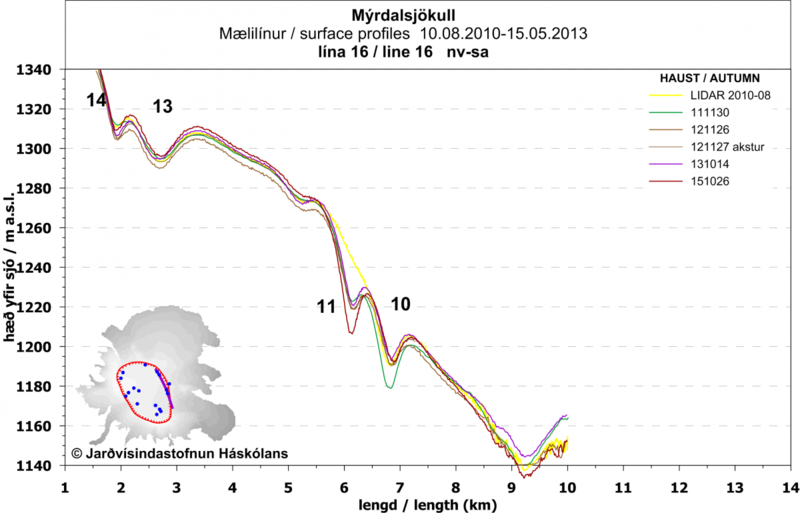 But the flood was in the river Múlakvísl on Mýrdalssandur and depressions in the southeast corner of the caldera became deeper. 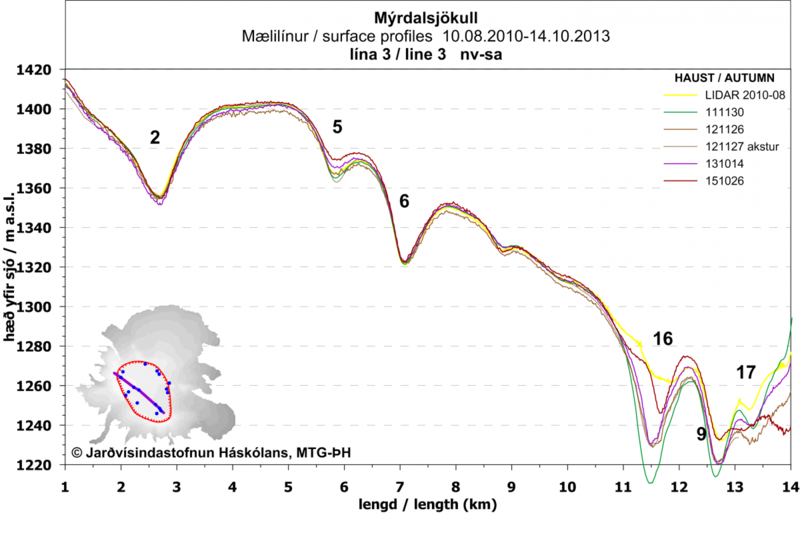 The status of geothermally-formed ice cauldrons in Mýrdalsjökull is monitored on a regular basis. Radar measurements of ice surface elevation and cauldron depth are done about twice a year, using an automated system based on ground-clearance radar and kinematic GPS. In addition inspection flights on a small plane are carried out about once a month from the village of Vík, south of Mýrdalsjökull. Results of the 3 latest surveys and the survey on December 17 1999 are shown on the profiles below. 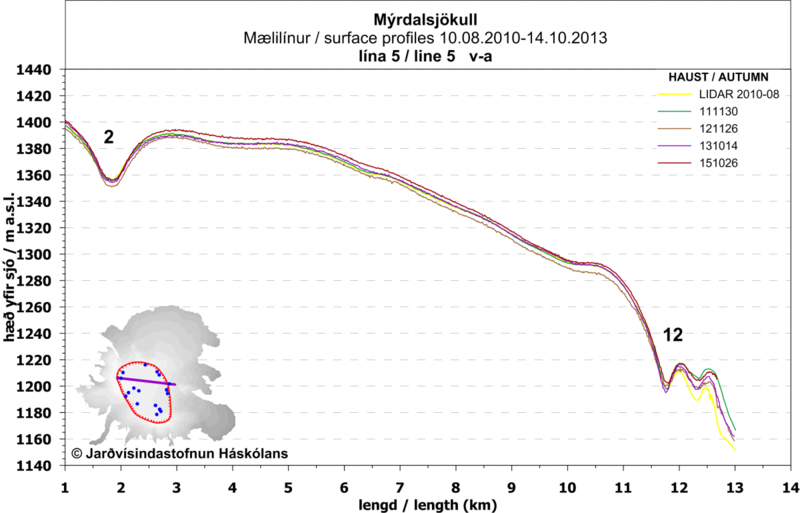 Ablation in summer lowers the surface elevation of the glacier by 4-8 m from spring to autumn. Accumulation of snow restores the elevation during the winter. From autumn 1999 to autumn 2001 cauldron 7 gradually got shallower but apart from that changes were not significant. Between autumn 2001 and 2004 some cauldrons grewn, due to increasing geothermal activity. 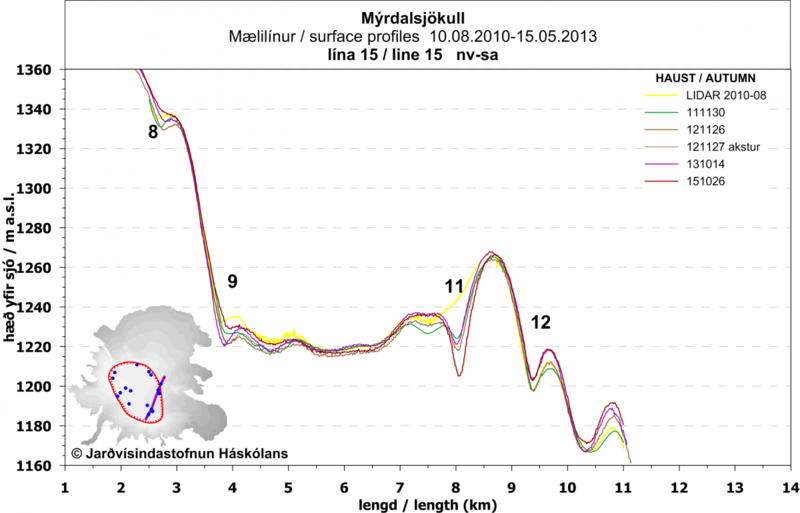 This increase was accompanied by increased seismicity and uplift (www.vedur.is), the cause probably being magma accumulation under the Katla caldera. 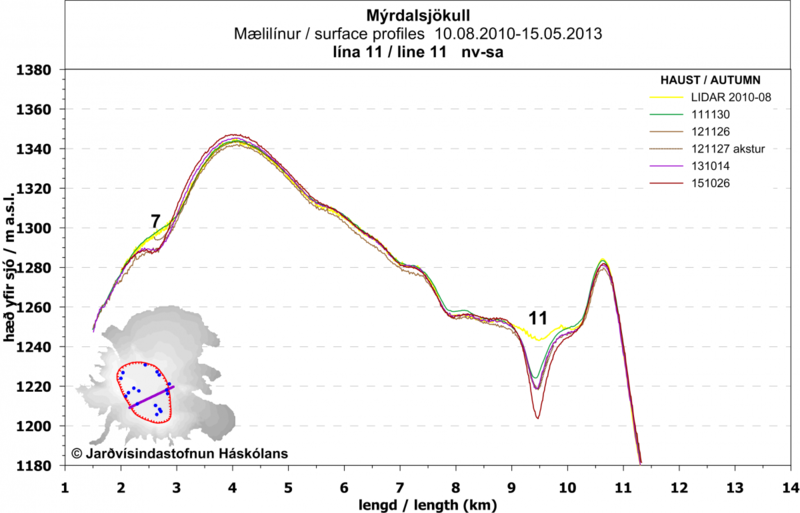 After 2004 geothermal activity declined until a sudden increase caused the flood in Múlakvísl 9 July 2011. Mainly cauldron 16 and 9 grew in size but changes could also be seen in cauldrons 8 and 10. 14. October 2013. 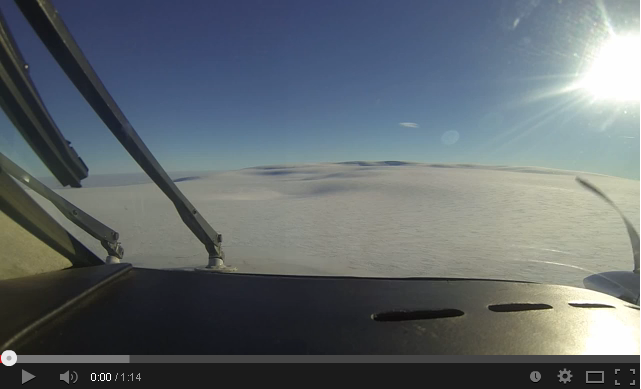 Video from Katla ice cauldrons inspection flight, Line 03, cauldrons K16, K09 and K17. Below all radar measurements are displayed for the nine flight lines that are surveyed on a regular basis. In the first flights, in the autumn of 1999, the coordinates of cauldron centres were not as well determined as later. Therefore the data is displayed in two groups. In addition, measurements made in spring are shown separately from those made in autumn. This is because of the annual variation in surface height caused by meteorolgical and glaciological processes.